Our Group Rates Can't Be Beat! Groups of TEN or more qualify for the special discounted rates. For every ten paid people, one person will play free. 1. 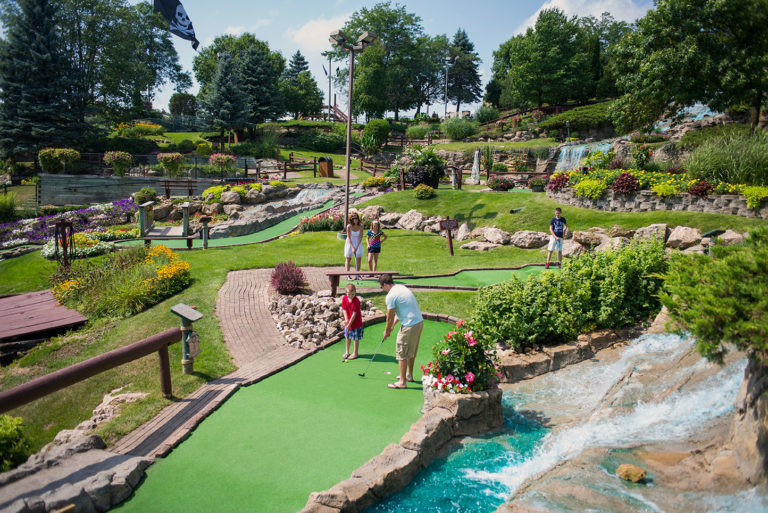 Pirate’s Cove Adventure Golf in Wisconsin Dells is like no other mini golf course! We have 5 different mini-golf courses, with a total of 91 unique holes. 2. In the lower ticket booth, we have an arcade where people of all ages can try their luck at winning a prize. Pack a lunch and enjoy our large playland and picnic area, with multiple shelters. Picnic shelters may be reserved for an additional fee. While you are here remember to visit Pirate’s Haven/Captain Scoopy’s Ice Cream and Candy Store and Aunt Jenny’s Got It All Store. To make your reservation, please click the Group Request Form above and submit that to us. If you have additional questions or to make a reservation via phone contact Dominic at (608) 963-4394 or Pirate’s Cove at (608) 254-7500. Once we receive your information we will send you a confirmation. Thank you and we look forward to seeing you this season. If so, please include your Tax Exempt Number below. Please use the format mm/dd/yyyy. Would your group want to reserve a picnic shelter? If yes, what is your start and end time?